8 mi @ 3:10 am..48 degrees, light rain, light wind, easy recovery run. 10 mi in the hills, 38 degrees with a light snow storm going on around me......oh what fun it is! 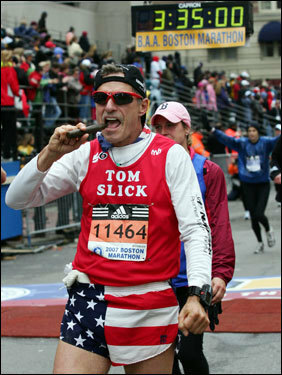 To Track My 2014 Boston Marathon Race by Text - Simply text my Bib # 22569 to 345678 using your US mobile phone and follow the instructions. two weeks, one day, and a wake-up and it's show time in Boston! what a gorgeous day for a run. 45 degrees, windy, total cloud cover. 16 miles in a garbage bag!!!! What more could a body desire except it's all in the bank! 14 days and a wake-up and it's time to do the Boston! 8 mi @ 3:20 am in the sandy hills. 48 degrees, clear, cool and dark. Boston is now just 10 days and a wake-up away! 7 miles in the Sandy Hills - 10 days till Boston! Did all you Boston Bound runners take a gander at todays prediction for the weather on April 21st at Boston.......Accu Weather! Sure glad we've got 9 more days till the show down at Bean Town! OK that's the last med-dist run. 12 miles in the Sandy hills. Even though it has been raining, snowing and hailing all day I managed to pick out a sucker hole in the weather and made the run without getting soaked to the bone! Yea! that't the first time in several weeks. Today was suppose to be a rest day but I let my taper madness drive me out to the road for a nice easy recovery run.....oh well it felt good. 6 days and a wake-up and it's all done but the crying!!!! here is the latest prediction for Marathon Monday in Bean town! I went to a Boston Marathon Bombing memorial run (5K) at the local Wasatch Running Store. It was a nice and there was a pretty good turn out. Three easy shake down miles today. I'm ready to do the Boston, I sure hope Boston's ready for me and all my good running friends. Here's todays prediction for the weather on Marathon Monday the 21st: My guess is that it will change at least 5 more times before we all toe the mark and head for Boston. No new is good news! OK everybody, it's time to assemble in Bean Town for the 118th running of the Boston Marathon......Good Luck! What can I say other than,"Not too bad for an old guy!" This years adventure at Boston was probably the best ever and it will be hard to top. I took the red eye out of Salt Lake City on Friday night and arrived in Boston early Saturday morning, so early that nothing was open, not even the Expo. I dropped my bags off at the B & B in the Back Bay Area and started wandering about the area. Couldn't check in to the B & B till about 2:pm. I went over to the finish line on Boylston and watched the going ons to kill some time looking at all the preparations for the marathon on Monday, so many inspirational signs and banners, everywhere. I actually stumbled on the Minister and some of the Church Ladies at the Old South Church preparing to give out scarfs to the runners as part of the Church of Christ's Year of Remembrance and Hope, Marathon Scarf Project 2014. I guess I was lucky, the Minister gave me a blessing and a scarf. I didn't think they were going to do this until Sunday at the Old South Church when they did the "Blessing of the Atheletes" service. After this I went over to the Expo and collected up my race bib packet and goody bag and wandered around the expo until I could get into my room. Hillbilly Runner Ronnie showed up later in the day and we returned to the Expo to pick up his race packet. Sunday morning we attended the Easter Services at the Old South Church at 9:am along with some 2,044 regular worshipers and Marathon Runners. During the Easter Service the Minister held the "Blessing of the Athletes" where the runners were also given a beautiful hand made scarf knitted in the blue and gold colors of the BAA signifying hope and courage for the Athlete in the up coming Boston Marathon. Attending Easter Services and the Blessing of the Athletes was a real delight for me, and I will make a point of attending in future trips to the Boston. Race day morning was exceptionally peaceful and rather non hurried and we made our way to the Boston Commons to get on the busses and depart for the Athletes Village in Hopkinton. I actually sat next to a fellow that was sleeping on the bus which in turn made my ride quite peaceful where I reflected on my own projected race plan that was just hours away. At the village I tried to be calm and continue to reflect on my race plan while takling to my friends, taking photos and waiting in the line to the "Temple of Doom". I don't recall how close it was to 11:am but the 3rd wave seemed to take off as scheduled. I got in line with the rest of the 3rd wave and started moving my feet towards Boston. I kept with my plan to start the race slow and avoid bouncing around ducking and weaving to advance ahead of other runners. From previous experience I know that the wave would thin out and I could start getting in some serious running about 4 or 5 miles down the road....it did. At the two (2) mile mark on the left side of the roadway there was the Biker Bar and all the partiers having' a ball. Wow, the smell of beer was thick in the air and it only made me want to stop and have a couple with them. The temperature at the starting line was about 53 degrees and the wind or breeze was barely discernable. A rather nice start. I would have preferred about a 43 degree start but it wasn't my choice. Wow, the 5k mat seemed to come up rather fast and I was past it. I looked at my Garmin and I was at about 25 minutes and thought, I am right on plan. I continued making my way along the course trying to maintain a steady pace that would result in a BQ at Boston so I can return here in 2015. I hit the half way point at 1:48:02. I had hoped to be there at the 1:38:00 mark, but this was satisfactory. I took time to reconsider my situation and found that all was well and my tire old man body wanted to play. I had a moment of mental let down about mile 14 where my brain asked me what the hell I was out here doing? I collected my thoughts and put a positive spin on and took off on down the road as I was entering the Natick and Wellesley hills. I tried to attack the hills going up, rest and maintain on the flats and kick it up on the down hill side. I t was amazing to see all the spectators, fans and freedom loving people lined up the entire length of the marathon. The crowd support was second to none this year. Even the "Scream Tunnel" at Wellesley was probably twice as loud and long as ever before. Then it was time to enter the hills of the "Killer Chain" in Newton. These hills are nothing compaired to the mountains that I train in, in Utah. But none the less, they are there and must be contended with. I again worked on maintaining a pace of between 8 and 8:30 minutes per mile as I attacked the hill upward, rested on the flat and picked it up on the back side. With this plan in mind, all of a sudden I was up and over "Heart Break Hill" and looking forward to some gentle down hill running into Boston. The temprature was at about 66 degrees, little or no noticeable wind and about 5 miles to get my 11th Boston Marathon finished. I ate my last double caffeinated Power Gel, chased it with a cup of water that was offered by one of the very young Patriots' Day / marathon fans and continued to race my plan. At 35k I was at 3 hours and 6 minutes into it and I felt really good and could see that I had done my plan right and I would be able to finish this race well. I started looking for the Citgo Sign that is prominently situated at about 1 mile from the finish line and kept my pace steady and focused. And there it was! And there were all the people that had filed out of Fenway Park after the baseball game standing on the marathon route cheering and supporting all the runners. Now the next milestone in my race was to round the corner and turn right on Hereford St. and then get my "Victory Dance Cigar" out and make the left onto Boylston and head to the finish line that is in sight from the corner. While making my final push to the finish line I reflected on how well the City of Boston, the people and the Boston Marathon had recovered from the tragedy only one year ago and had come together as "Boston Strong" and made a stand against Terrorism and Tyrany for Freedom, Justice and Liberty for All. I stepped over the line at 3:46:42 and was completely satisfied with my race which also yeilded a "BQ" for 2015. Thank you to all my friends and my new friends and all the people that have made the Boston Marathon the success that it is! May the Boston Marathon continue for all time to come! 7 mile MPS status run......in the hills. 45 degrees, cloudy, windy, some rain.